Before the proliferation of personal computers, people would often need to dictate their messages to professional typists (such as secretaries) who were trained in touch typing to quickly transcribe their thoughts into printed text. Today, of course, nearly everyone knows how to type, and so it is often easier to type our own responses to email and other messages, both personal and professional. However, dictation still has its place, and with little exception it's typically much easier and faster to get one's thoughts out in speech than it is to type them out by hand. Even listening to a recording and transcribing it often results in frequent pausing of the audio to catch up and try to get the words down before the subject changes and the next train of thought begins. If you have recordings of dictations you need translated, whether of personal or business correspondence, works of fiction, or for any other purpose, Translation Services USA can help you quickly and easily get your thoughts put into text with our dictation transcription services. 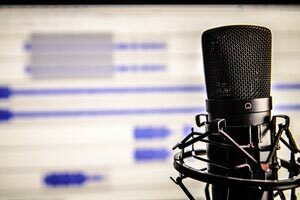 Transcription of dictation involves sending the audio to a professional, human dictation transcriber who then uses their experience, along with specialized software or hardware, to listen to the recording at whatever speed they need to transcribe dictation from audio into text. What may take you hours to type out yourself may be a quick afternoon's work for an experiences transcriber. Your time is worth the money spent! Whatever your needs, contact us today for a free estimate for your dictation transcription project and we'll be back in touch with you to answer any questions as soon as possible!